This is the thirst set of Tasks to be released by Jagex, and the first one that is for Free-Players. 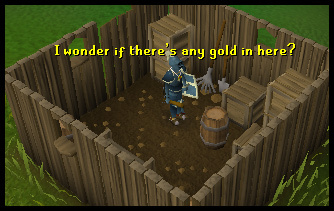 Talk to Explorer Jack in Lumbridge, Bob in Lumbridge, or Ned in Draynor Village. 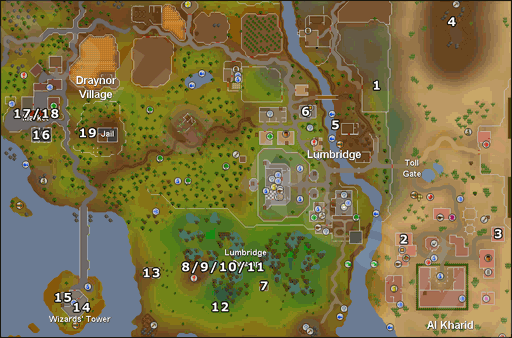 To help you find Jack, here is a map, leading from the Lumbridge courtyard, to his house. Bob runs the axe store in Lumbridge. You can find him residing there. 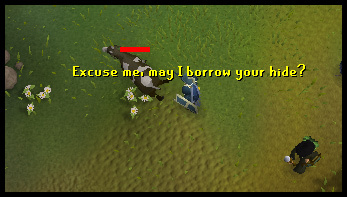 Ned can be found in Draynor Village. Here is a map from Lumbridge Courtyard to Ned. After a long conversation, you will get choices. Read each one of them carefully, then end the conversation. 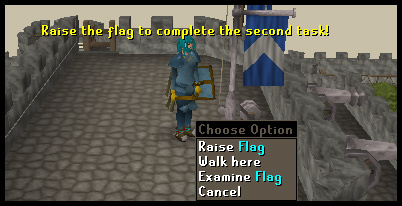 You have successfully started the Lumbridge/Draynor Tasks. 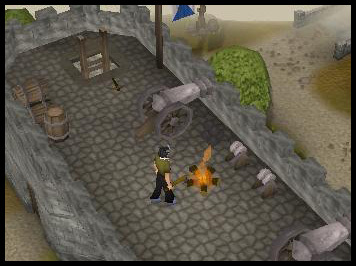 Go to the Lumbridge Castle, and go to the second floor. Then go to the bank and climb the ladder that's nearby. (North side of the bank) Then you will reach the pinnacle on Lumbridge Castle's roof. Go to the Lumbridge Castle, and go to the third floor. To the right of the bank there is a ladder. Go up it, and use the handle to raise the flag. Go to the first floor of the Lumbridge Castle, and walk down the corridor and enter the Duke's bedroom. Speak with the Duke to introduce yourself. Go to the North-east of the castle to find the Doomsayer. He is next to the Lumbridge guide. Speak to him and ask him about the Warning System. 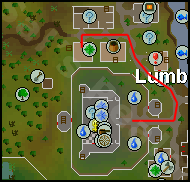 Go to the North-east side of the castle to find the Lumbridge Sage. He is sitting at a table just south of the Doomsayer. Speak with him to find out more about the Stronghold of Security. Go to the General Store in Lumbridge, and trade with either the Shop Keeper or the Shop Assistant, then close the store window. To get to Fred's farm, head north on the path outside of the general store, until you come upon a field with sheep. Enter the field through the gate. Go north-west to the stile. Go over it, and enter Fred's house. Head towards Varrock. Right before you enter the city, there will be a dirt path leading off westerly. Follow it to the Champion's guild. From there go north-west to the mining area to mine some clay. 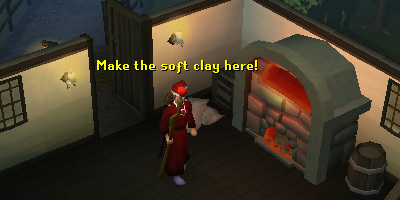 Walk to Draynor Village with a bucket of water and clay. Go into the potter's house and use the bucket of water on the clay to complete the task. To make a pot, go to the southern building. Then use the soft clay you just made on the potter's wheel ( ). 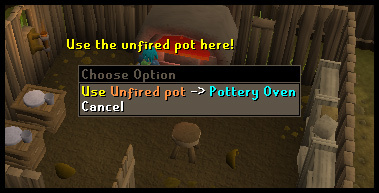 Choose the first option, make a pot. Use the unfired pot you just made on the pottery oven. Head south from Barbarian Village. Then walk around to the entrance. (southern most point) and enter through the main entrance. Exit to the south once the completion message appears. Please view the map to know how to get here. When walking you will eventually come upon a wheat field. Pick one piece. Go north, enter the mill, and go to the very top floor. Put the wheat in the hopper, pull the lever, and go to the bottom floor. Collect the flour in the pot you made to complete the task. Go to the Draynor Village Market until the completion message appears. In Draynor Market, you can find the Town Crier. Talk to him about the Rules of Conduct. Note: You don't have to read the book he shows you. This is pretty self explanatory. Go to the Wizard's Tower. (located at point 16 on the map) and go to the top floor. You might get lost, so be sure to check the map. Once arrived, use your pickaxe and mine some copper. See map to get there. You will find a fishing tutor. If you already don't have a net, pick one up. 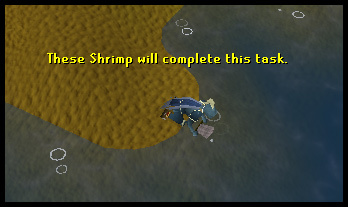 Then fish until you catch a shrimp. To have the Fishing Tutor send you on an errand, right click on the tutor, and select "Work-for". Accept the task. Note: You do not have to complete this task. From the center(ish) of Lumbridge, and head south until you get to a church. Go into the church and ask Father Aereck if you can look at his gravestones. Note: This task requires that you must have completed The Restless Ghost quest. 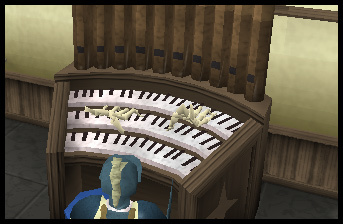 Once in the Lumbridge Church, walk over to the organ and click on it. Once in the Lumbridge Church, walk to the nearest ladder, and go up it. Go up another ladder, and ring the bell. 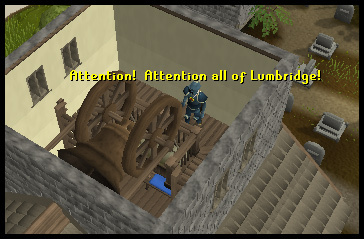 You will confuse the citizens of Lumbridge. Head to the Al Kharid Gate. Right click on the gate and choose "Pay toll" (requires 10gp). If you have completed the Prince Ali Rescue quest, you will of course be let in for free. Congratulations! You have completed the Beginner tasks! Head east across the bridge from Lumbridge. Follow the path north until you see a cow field. Kill one of these and pick up its Cow Hide. Make your way through the gate to Al Kharid. Head southeast from the gate until you come to the Tannery. Trade Ellis and have him make you one Leather. This will cost you 1gp. Head northeast until you see a Crafting Shop, indicated by a Needle. Purchase a Needle and one roll of Thread. Use the needle on your Leather, and select Leather Gloves. Directly north of Al Kharid, there is a Mine. Throughout it, you can find Iron. 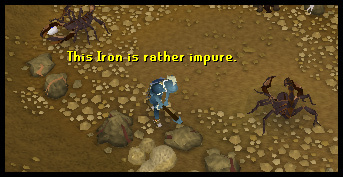 It is recommended that you mine two Iron, you'll need two Steel Bars later on for a Medium Task. 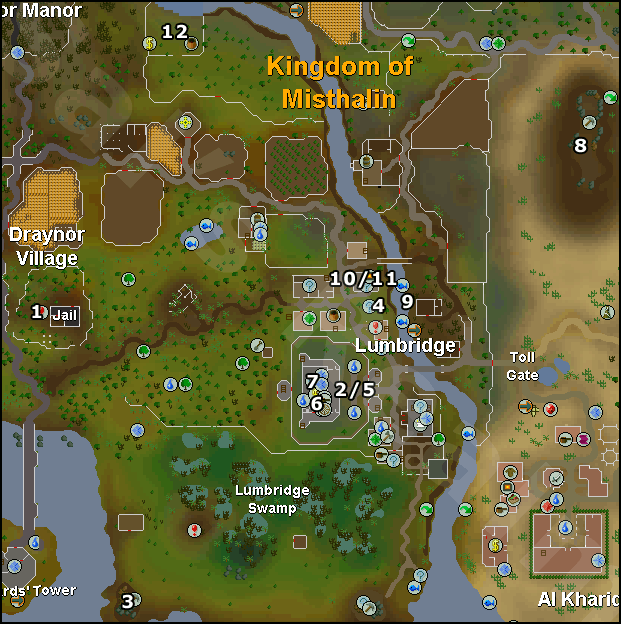 Starting from Lumbridge Castle, head east across the bridge. Between the two bridges, there is a place to fish. Bait fish here to fish for Pike. Head west back across the bridge and north to the Furnace in Lumbridge. 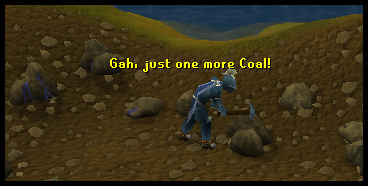 Use an Iron Ore on the furnace while holding two Coal in your inventory. It is recommended that you make two Steel Bars for later on. Move south through the Lumbridge Cemetery. Once in the Swamp, in the middle you will find a shed. Simply open the door to enter. Right outside of the shed, there are some rats. Kill one of these and take the meat for later. All around the swamp there are trees. Cut one of them down. 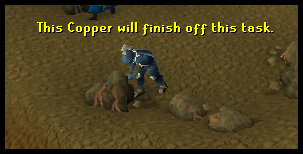 Use a Tinderbox on the Logs you cut earlier. 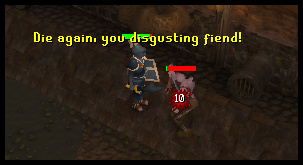 You must do this in Lumbridge Swamp. Use the Raw Rat Meat from step 8 on the fire from step 10. Try not to burn it. Starting at the shed in Lumbridge Swamps, head southwest until you see the Water Temple. You can use the Locate option of the Water Talisman to help you find it. Make sure you've dropped your Ghostspeak Amulet. Head northwest from the Water Altar, to a small wooden building. Inside, speak to Father Urhney and tell him you lost your Amulet. He'll give you another one. You can drop this one. Head northwest, then south on the bridge to the Wizard's Tower. Head up the stairs to the third floor and into the room with the caged Lesser Demon. When it is in the cage (alive), click on the rail to taunt it. In the basement of the Wizard's Tower, you can find Sedridor. Talk to him and have him teleport you to the Essence Mine. Continue north across the Bridge from the Wizard's Tower. 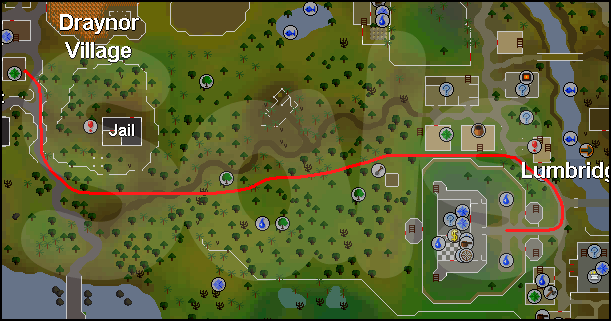 Follow the path north then west to the Draynor Bank. Speak to the banker about accessing your bank account. You can find the Wise Old Man in the house closest to the north side of the bank. 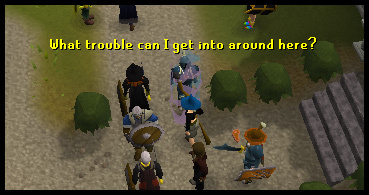 Speak to him and ask him to search your bank for unnecessary quest items. Climb the stairs in the Wise Old Man's house and find his Telescope. Click on it to see a cut scene of him viewing.... I can't tell you that, it would spoil the fun. Find out for yourself. Exit the Wise Old Man's house and go east to the jail. Find the dungeon in the fenced area with the jail, open the trapdoor, and go down. Kill one of the zombies. 1,000 experience to any skill higher than 30. You'll need two steel bars and a hammer for this task. 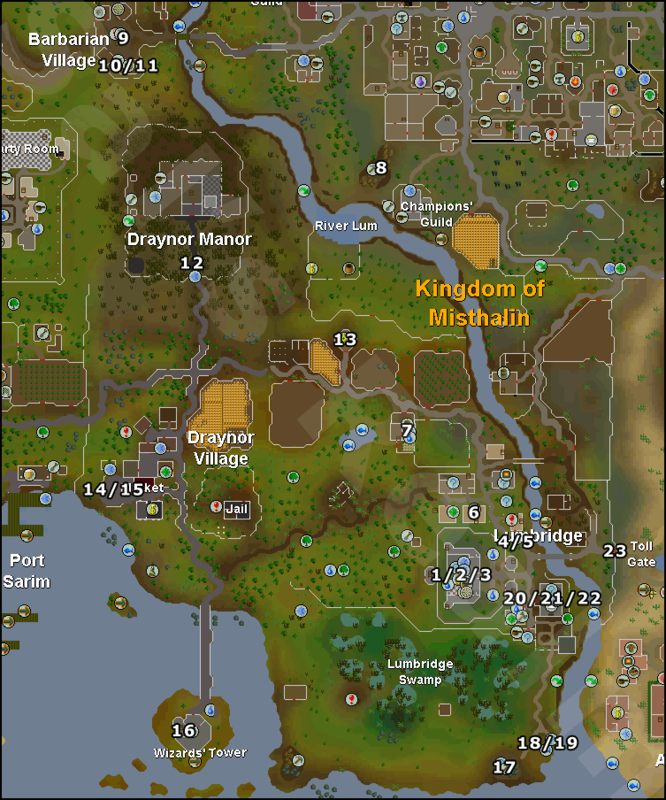 Starting in Lumbridge Castle, head directly west to the Draynor Jail. Climb down the trapdoor and make your way north, into the room off the main passage. In the middle, you will see an Anvil. Use a Steel Bar on it. From anywhere in the game, Use the Teleport to Lumbridge spell. You'll end up in the middle of the Castle's courtyard. 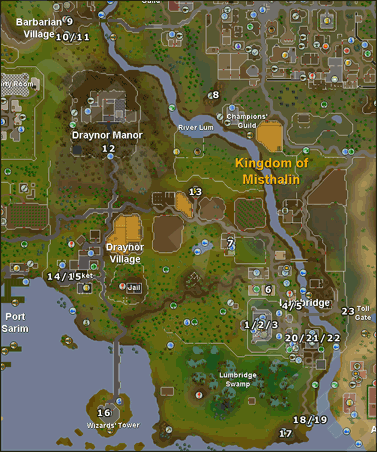 This mine is located in the far south west of the Lumbridge Swamps. There are a number of places to mine Coal here. These trees are on the west side of the River Lum, between the two bridges near the Woodcutting Tutor. Bring an axe and cut one log. 5. Light a willow log fire on top of the Lumbridge Castle gatehouse. Use a Tinderbox on the Willow Log from the previous step. 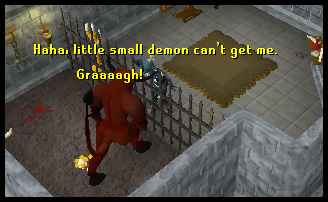 Beware, you must do this within the Lumbridge Castle gatehouse. You will find the Lumbridge Kitchen on the base floor of the castle. The stove is located in the southern end of this room. Use a Raw Lobster on it. Climb the stairs to the second floor of the castle. Duke Horacio is in the northern room. Speak to him and ask him about Dragon Slaying. Make your way across the river, through the Al Kharid gate, and northeast to the Al Kharid Chasm mine. About halfway up, on the western side of the mine, there are three silver ore piles. Mine an ore.
Head back through the Gate towards the river. Between the two bridges there are places to fish. Lure fish here until you get a Salmon. Cross the river again and north to the furnace. Use your Silver Ore from earlier on the furnace. 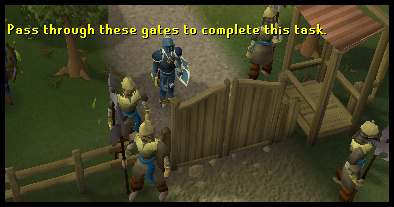 Head east through the gate to the Al Kharid crafting store. Purchase a Holy Mould. Head back to the furnace in Lumbridge (Al Kharid will not work) and use the Silver Bar on the furnace. Select the Holy Symbol. 12. Get Beefy Bill to bank something for you. 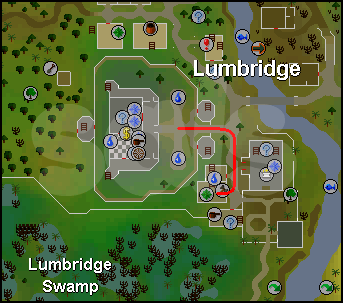 Make your way out of Lumbridge following the road northwest, then follow the path to the Windmill. Behind this is a field where you can kill two Cows and collect their hides. Use them on Beefy Bill, and he'll bank one at a ratio of 1:10. 1,500 experience to any skill higher than 35.